After our beery afternoon at the Volunteer Arms, we headed over to Cotham in search of food and more beer. The last time the OH had been to Bristol, he had stumbled upon a rather excellent little off-licence stocking some of the finest beer of the region. Corks of Cotham looks from the outside like the average wine and spirit merchant, but if you venture to the back you will find an absolute treasure trove of Bristish ale as well as a well-picked selection of American and Continental beer. 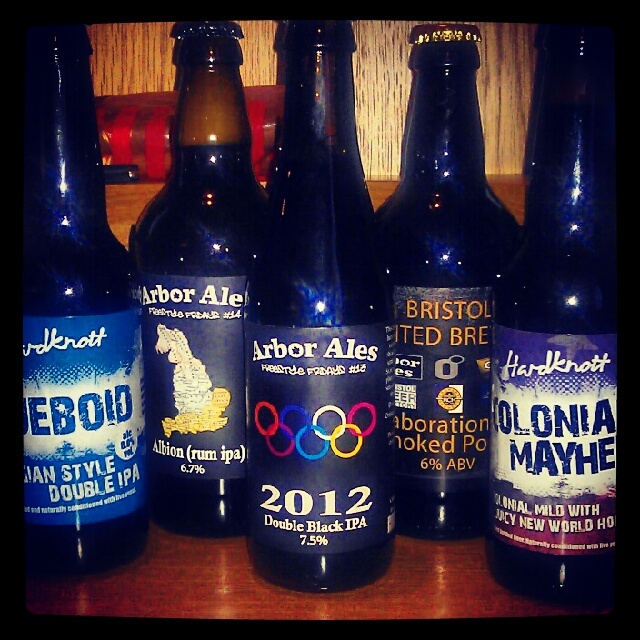 I originally planned to call in for another bottle of the Bristol Collaboration but was seduced by the selection and came away with a couple of Hardknotts and very special Arbor Ales bottles, both of which are impossible to get where I live. Since we were in Cotham, we decided to call in at Beerd, Bath Ales’ new concept craft beer and pizza joint. Although the bottle menu was a bit run-of-the-mill, the taps boasted a prettty nice selection of local ales as well as some keg from further afield. They have resident beers as well as guests so make sure you scan the bar or ask somebody before you order! I went for a pint of Bristol Beer Factory No7 (4.2%ABV), their Best Bitter which was a fairly pleasant, biscuity bitter with a citrusy hop. Unchallenging and a pretty good choice to go with my exceptionally delieious anchovy pizza! Well-fed, we went for a night-cap with our friends who had just joined us from London at the lovely Colston Yard which had one of my favorite Bristol Beer Factory regulars on, their rather delectable Milk Stout (4.5%). A pretty drinkable sweet stout; just right to unwind for the meatfest ahead! We were up super-refreshed and ready for the mighty Grillstock the next morning. The moment we were got through the gate we were handed tokens for free Jeremiah Weed which was the only thing stopping me from making beer the first drink of the day. The main event at Grillstock is the King of the Grill competition which sees the international superstars of barbecue and amateur teams battle it out to be the Grand Champion and win the opportunity to compete in the American Royal Invitational in Kansas City. 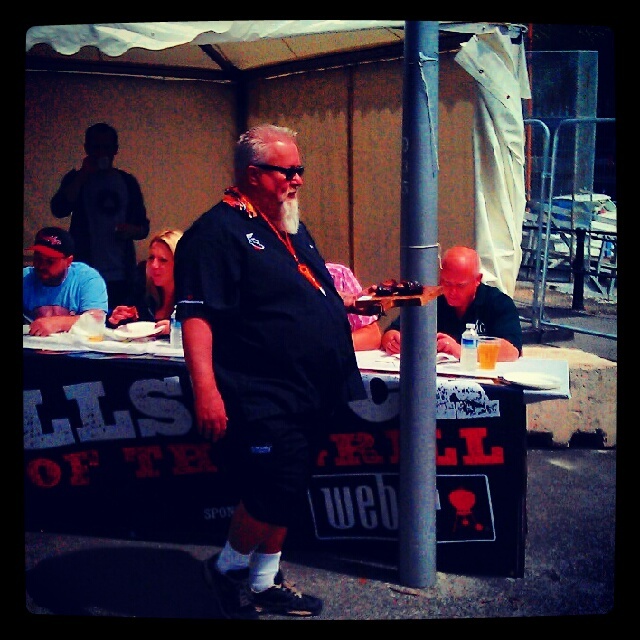 The judging panel is an impressive mix of award-winning experts including Dr.BBQ, who has been involved in cook-offs as long as I’ve been alive, and guests from the world of food and food writing. Throughout the weekend, they are presented with entries from each of the teams for seven rounds including brisket, ribs and desserts. As well as the competition, there’s a rather punishing chilli-eating contest, stalls where you can buy high quality goodies to cook with at home and live bands all day. already off to a good start when I was offered fresh-off-the-barbeque lamb ribs which were just astounding – you must try them! One of the things that makes this event so awesome is that, alongside the competition entries, the teams cook all manner of juicy meat-stuffs through the day to offer to the happy crowds and will happily talk about what they are doing and offer useful tips. The highlight had to be from the Bad Byron team member known on Twitter as @racksofruin who had created an extravagant beast from cheese and veg, encased in meat and all rolled up in bacon. Sweet! There’s also rich pickings hanging at the judging tent since once the judges have taken what they want the rest is offered to spectators! I managed to score an absolutely immense beef rib from Dr.BBQ himself as well as pulled pork and lots of pit beans. The official beer supplier, Bristol Beer Factory, brought a nice selection to wash it all down which included Milk Stout, the mighty Southville Hop, Acer and Bitter Californian. 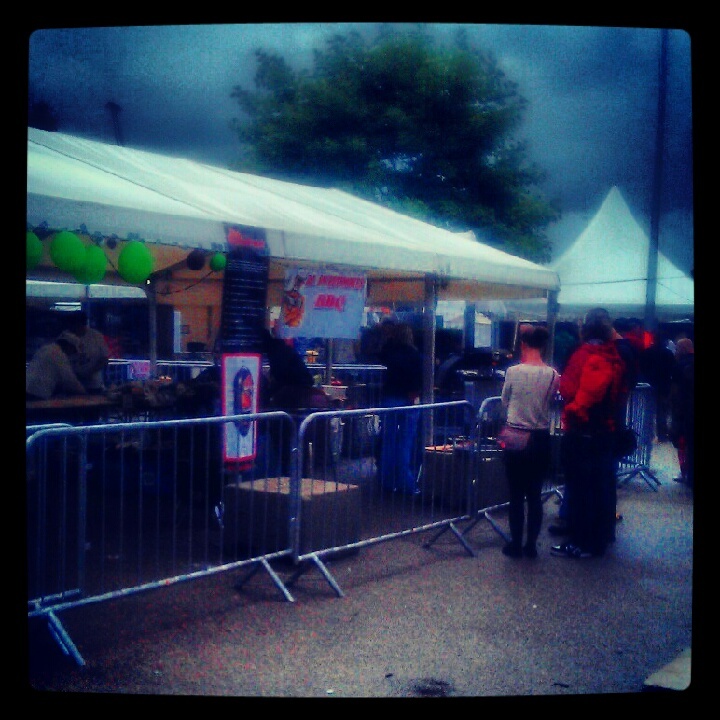 Although the sun didn’t make much of an appearance, the hoppy delight of Southville more than made up for it. I was slightly disappointed on day 2 when a large amount of the beer had run out including my favorites. Lucky for us, the new Bristol Farm Shop were selling a lovely selection of local produce including beer so the day was saved. Of course, we were reminded that it was not meant for consumption at the festival and we did spend a lot of time trying to hide it like kids whenever we saw security! I was particularly taken with the Arbor Yakima Valley IPA (7%ABV) which was a joyful explosion of hoppy candy sunshine. Arbor’s dark ruby old ale, Old Knobbley (4.5%ABV), also proved to be a pretty good choice. I found the burnt woody taste slightly unusual since it gave a bitterness quite unlike the IPA I’d had previously! Another fabulous weekend in Bristol then. Admittedly I came away a lot heavier but full of ideas for cooking and even found a couple of new favorite breweries to add to the list. I’ll definetly be back soon – very soon indeed for the Beer Factory tour. I can hardly wait!